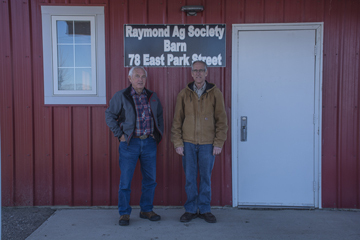 Westwind Weekly photos by Allison Billings Walden Thompson and Ken Steed are working on having Raymond's Ag Society barn designated as a pet evacuation centre in case of emergency. The Town of Raymond is looking into establishing a pet evacuation centre in case of emergency, with one possibility being the local Agricultural Society. Ken Steed, the town’s director of emergency management, said the town is exploring various options for a pet evacuation centre. According to Alberta Health Services regulations, in case of evacuation, pets and their owners must be separated as a health precaution. “We have a plan for an evacuation centre, but no place to put pets,” Steed said. He said the Ag Society offered to assist, but stressed that no location or plan has been confirmed. “We’re in the process of writing a plan right now that says if there should be an emergency and we remain in Raymond, then yes, they could handle pets there,” said Steed. The hope is that the Ag Society can serve as a shelter for both pets and their owners, with each in a separate room to comply with AHS standards. “The reason we would use the ag centre — we could actually put people there too — would be if we evacuated only a portion of the town and that area could be considered a safe zone,” he said. Weldon Thompson, the society’s vice president, says the idea for a pet evacuation location was realized when residents of Milk River were evacuated to Raymond due to flooding a couple years ago. “We’ve got two main buildings,” said Thompson. “One is the big barn … and then we’ve got the building right next door, the main building. “What we would do is handle the pets probably in the loft of the barn, with their owners staying in the bottom of the barn. The Ag Society also has kitchens in each building, which would make it easier to supply evacuees with food.